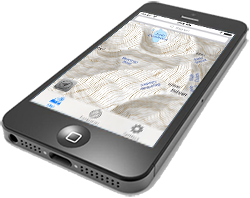 There are dozens of smartphone apps that can help you when you travel in avalanche terrain. There are also a few that are downright dangerous. As with technology in general, the available apps change faster than we can track. This page focuses on the categories of avalanche-savvy apps rather than on specific apps. Search the Apple App Store or Google Play Store for the latest products. Because almost all avalanches occur on slopes that are between 30° and 45° (and most occur on slopes between 35° and 45°), you can reduce your risk of being involved in an avalanche accident by knowing the steepness of the terrain. And research has shown that most backcountry travelers do a poor job of visually estimating the slope. 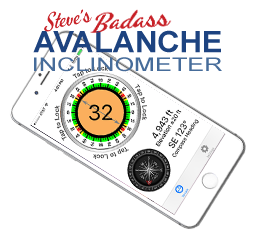 Inclinometers have you align your phone across, up, or down the terrain and then display the slope angle. Some inclinometers use your phone's camera while others have you align the edge of your phone with the slope. There are generic inclinometers like SeeLevel for iOS and the Clinometer + bubble level, and there are inclinometers built into many of the avalanche forecast center apps, but I'm strongly biased in favor of the Avalanche Inclinometer. Another great use of your smartphone is to get information on current avalanche conditions. Some avalanche forecast apps, like Avalanche Forecasts, provide information on current hazard ratings for numerous locales. Other apps, like the Utah Avalanche Center, provide more detailed information for one region. The Utah Avalanche Center's app also harnesses crowd-sourcing by allowing you to snap a photo of an avalanche, measure the slope's angle, and submit the information as an avalanche observation to the center's forecasters. Generic GPS software, like MotionX GPS, are helpful for recording tracks, saving waypoints, and navigating in the backcountry. They also allow you to share the information via email. The Wasatch Backcountry Skiing App (developed by the author of BeaconReviews.com), contains an index to almost 1,000 backcountry ski locations. In addition to displaying your current location on a topo map ("Where are we anyway? 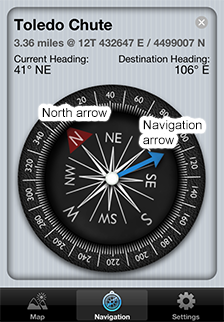 "), the WBSkiing app's unique compass will point to your selected destination. You can watch three-minute videos of the WBSkiing running on the Apple iOS or the Google Android operating system. You can purchase the Apple version here and the Android version here. A few apps, and we shudder to give them publicity, are designed to help you locate someone who has been buried in an avalanche. The reality is, smartphones just don't have the hardware to even be considered a replacement for a real avalanche transceiver. That said, you can read about this category of apps.